A Banbury councillor’s plea to the town’s regular bus service provider to rethink cuts in Hanwell Fields and Hillview Estate have been rebuffed. Cllr Tony Ilott, a town and district councillor, met Stagecoach bosses on Friday to be told they cannot afford the time or buses to change their new timetables which, from Monday, now serve Hardwick and the new Hanwell Chase estate. Mr Ilott is pressing ahead with Plan B – trying to engage a different provider to offer some service on the axed routes. “I met with the Stagecoach CEO Martin Sutton on Friday but failed to get them to change their minds. They had all their timetables printed up,” said Mr Ilott. “I am hoping that a private contractor may be able to provide a service for Hillview Estate and Hanwell Fields even if it is not such a full service,” he said. “I think it can be done and I am working on getting some money together. I’m quite hopeful that we can come up with some kind of service which might be scaled down and not quite so frequent. Mr Ilott said he understood the new provider would be able to accept bus passes. Stagecoach axed its B8 and B10 services on Sunday in favour of a new B9 service to the Hardwick Estate and round in a loop to pick up residents of the new Hanwell Chase estate. The company said it could not make the B8 or B10 profitable but it will be receiving subsidy in the form of (time-limited) developer contributions that mean the B9 is viable. The company is only paid about half the value of a fair in reimbursements for pensioners’ tokens and is not allowed to take ‘top up’ money which a number of elderly people said they would be prepared to pay rather than have to rely on taxis. 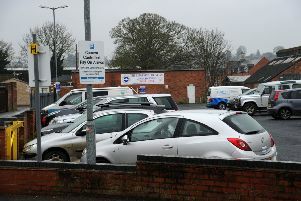 Hanwell Fields resident Lisa Readman said: “Despite knowing for weeks that bus services in Banbury would be changing, Stagecoach did not make new route information available on the buses until last Wednesday. “Not sharing this with the people who keep them in business was disgraceful – but they did it because they have every passenger over a barrel. “I and most other passengers will adapt to the new routes because we have no choice but that doesn’t mean we find them acceptable,” she said. Developer contributions can last up to eight years.